Plastic lenses with damaged anti-reflective coating can adversly effect vision. 2 How Do I Repair Scratches on an Oakley Sunglasses Lens? Removing anti-reflective coating from your plastic lenses is necessary when the coating becomes compromised. If the anti-reflective coating is damaged, the lenses appear lightly scratched or smudged. Damaged anti-reflective coating affects your vision by making it difficult to see through your plastic lenses. If done correctly, removing damaged coating may be a more economical solution to the problem of scratched lenses than replacing them. Please follow the instructions carefully. Anti-reflective stripping solutions contain acid, so misuse, such as prolonged lens exposure to the solution, may cause additional damage to your lenses. Put on rubber gloves and protective goggles to protect your hands and eyes from anti-reflective solution. Remove plastic lenses from your frames, and set them aside. Refer to specific manufacturer instructions regarding how to remove lenses from your particular frames. Pour anti-reflective coating solution into a plastic bowl. The solution should be room temperature, and enough solution should fill the bowl to completely submerge the eyeglass lens. Pick up one lens with the wooden tongs, and place it in the anti-reflective stripping solution, plus side down (convex side down). Allow the lens to sit in the solution for 15 seconds. Remove the lens from the anti-reflective solution, and set aside. Submerge the second lens in the anti-reflective stripping solution, plus side down (convex side down). Remove the lens after 15 seconds, and set aside. Rinse each lens in tap water, and dry thoroughly with a cotton cloth. Inspect lenses to make sure all the anti-reflective coating has been removed. If any coating remains, resubmerge the lens with wooden tongs in solution for an additional 5 seconds. Rinse the lens with tap water, and dry with a cotton cloth. Put a lid on the bowl containing the anti-reflective solution to prevent it from evaporating. Reinsert the plastic lenses into your frames. 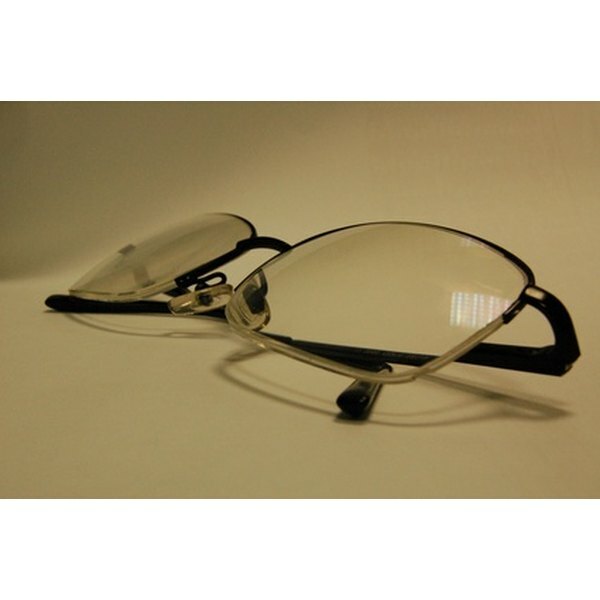 Refer to your frames' specific manufacturer instructions regarding how to reinsert lenses. Many optical stores may remove the anti-reflective coating from your lenses if asked to do so. Most anti-reflective stripping solutions contain hydrofluoric acid and should be handled with care. Bridget Evanson has been writing a retail optical blog since 2009, now contributing optical-related articles to eHow. She has more than a decade of experience in high-end optical retail management. Evanson is certified by the American Board of Opticianry and received a Bachelor of Arts in psychology from Winona State University.